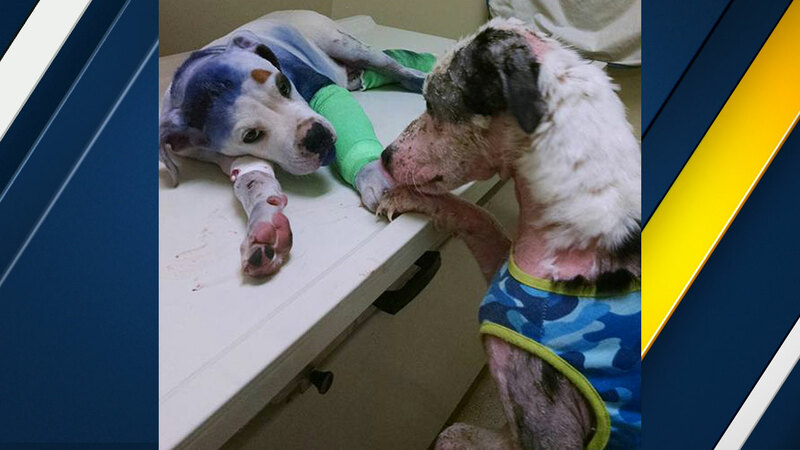 SOUTH CAROLINA -- Two abused dogs found comfort in their companionship as they recovered from injuries at a South Carolina animal clinic. Simon is a rescue dog who has been through a lot. But that hasn't stopped him from befriending 4-month-old Sammie at the Paws and Claws Animal Clinic. Sammie was shot in the head, dragged behind a car, spray painted and left for dead by his owner. The woman then took him to the pound so employees there could "finish the job," according to the Paws and Claws Facebook post. The puppy is now making a comeback, in part with help from his new friend Simon.